As the pillar of the Ruhr metropolis, Dortmund is the largest city in the region with approximately 600,000 inhabitants. Overall, the Ruhr region, with over 53 cities and 5.3 million inhabitants, constitutes one of the largest urban areas in Europe. For decades, smokestack industries and factories formed the region’s image. Since the 1960s, the region has experienced constant structural change. Mines and steel foundries made way for modern industries, services and cultural offerings. Above all, the city of Dortmund has been awarded several times for its positive structural changes. Successful developments in the Ruhr region were also recently recognized with the title “Cultural Capital of Europe 2010.” According the economic magazine Capital, the city of Dortmund in the Ruhr region, has the best promising economic forecasts up to 2013. Also in one’s leisure time, Dortmund has a lot to offer. Cultural events offered range from the opera house and theatre at the concert hall to various movie theatres, regular readings and diverse museums. Sports fans can especially get their money’s worth in Dortmund. In particular Germany’s largest soccer stadium (formerly Westfalenstadion) represents a highlight in the Ruhr Metropolis. During a Borussia soccer home game, the stadium can hold more than 80,000 fans, represents a highlight in the Ruhr Metropolis. 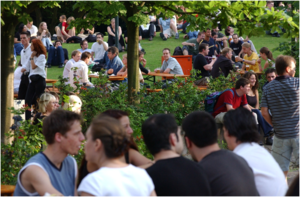 Those who enjoy more peaceful environments can enjoy his/her time at one of Dortmund’s parks or in one of the numerous cafes in the old market or Kreuzviertel district. These districts serve as ideal starting points for extended shopping tours in the city. The leisure time offerings in Dortmund are completed by the versatile night life scene in bars and clubs or at the student parties that frequently take place. Unlike other large cities, there is suffi cient student accommodation available in Dortmund. As a result, rents are low, compared to other metropolises in Germany. Particularly pleasant areas to live and work in include the Kreuzviertel and Klinikviertel. These districts offer comfortable apartments in older buildings and a large number of attractively renovated restaurants. In addition, the student dormitories, located close to the campus, offer ideal conditions for living and learning. The campus of the TU Dortmund is divided into two parts - the North Campus and the South Campus. Both are connected by elevated train. All facilities at the TU Dortmund are centrally located, to ensure that students can make it from one course to another within a short period of time. Between lectures and seminars, the university offers various places to eat. The newly-renovated student cafeteria on the North Campus, offers between 12 and 14 meals daily, in addition to buffets, Wok meals and much more. The university campus is only six minutes from the down town area by commuter train. From Bochum (14 min.) and Essen (32 min.) the trip is slightly longer. Down town Dortmund can easily be reached from the campus by subway or bicycle. Student Initiatives in the Faculty of Business and Economics offer all students, who want to do more than just study, the opportunity to participate actively in student and university life. The student council within the faculty is elected by students and represents the students’ interests with the faculty and teaching staff. The council’s main tasks include: providing students past examination papers, organizing informational events to help with subject selection, and various other services. Furthermore, the student council organizes the Orientation Week in the winter semester for incoming students and, it also hosts parties regularly. The student organization AIESEC provides students in all majors with internships in eighty member countries throughout the world. As such, they provide interested students with support from the beginning of the application process to the completion of the internship. Each year in November, students have the opportunity to meet potential employers directly on campus. Companies attend the job fair organized by the students themselves, and inform students about internships, entry-level career opportunities and temporary employment abroad.